Thousands of migrants are crossing into Slovenia from Croatia after Hungary closed its border to them. About 4,000 have arrived in Slovenia, the UN refugee agency says. Most aim to travel on to western Europe. 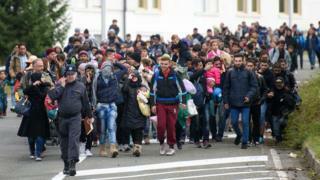 But there could be delays for some - the Slovenian authorities have said they will restrict the flow of refugees to 2,500 a day. Croatia has asked the country to accept double that number, Slovenian officials say. Prime Minister Miro Cerar said Slovenia would accept the migrants as long as Austria and Germany kept their borders open. Hungary said it had closed its border with Croatia at midnight on Friday because European Union leaders had failed to agree a plan to stem the flow of asylum seekers. Last month it also shut its frontier with Serbia, which was another transit route to Western Europe. Around 1,000 refugees and migrants made it across Slovenia and over the border into Austria on Saturday, Austrian police said. But there is a growing build-up of people on the Serbian-Croatian border, having been diverted from the route through Hungary. Around 40 buses of migrants were waiting to enter Croatia from Serbia on Sunday, the Croatian news portal Index reports. Meanwhile, just across the border in eastern Croatia, some 4,000 migrants were waiting at a reception centre in Opatovac, hoping to be transported across country to the Slovenian border. Many of the refugees have already spent weeks walking through Greece, Macedonia and Serbia to reach the Croatian border. One aid worker on the Serbia-Croatia border said there were 2,000 people waiting to cross, many were exhausted and lacking basic supplies. Jan Pinos, from the Czech Republic, said the build-up of people at the border was like a "dam on the river". "The new system... the new flow of the river of refugees through Slovenia does not work yet," he told the Associated Press, adding: "The capacity of this new journey is not enough." Slovenian Prime Minister Cerar said on Saturday that the army would be sent to help police with the flow of migrants, but stressed they would be helping with logistics and equipment. "We are going to focus even more on safety and security and order so our country can function normally,'' he said. Croatia is a member of the EU but, unlike Hungary and Slovenia, it is not part of the Schengen zone of passport-free travel. However, Hungarian Foreign Minister Peter Szijjarto said border controls with Slovenia would also be temporarily reinstated to safeguard Hungary from a "mass wave of unidentified, uncontrolled migrants". German Chancellor Angela Merkel is in Turkey for talks on the migrant crisis with Prime Minister Ahmet Davutoglu and President Recep Tayyip Erdogan. At a joint news conference with Mrs Merkel, Mr Davutoglu said Turkey would do its best to work with Germany to prevent illegal migration, but added that the crisis could not be resolved without a solution to the Syrian conflict. Mrs Merkel said Germany was ready to support speeding up talks on Turkey's accession into the EU. Turkey is currently a candidate country. Tens of thousands of migrants are arriving in the EU from Turkey, risking a sometimes perilous sea crossing to the Greek islands. On Saturday, 12 refugees - four of them children - drowned while trying to reach the Greek island of Lesbos, the Turkish coastguard said. They were thought to be from Syria or Afghanistan.